What Makes us Susceptible to Fear? What is the Purpose of Fear? What Can Others Do to Help Those Who Are Afraid? Falling Into Grace by Justice St. Rain of Special Ideas takes an honest look at the many things in the Bahá’í Community that can test your faith from the fellow Bahá’ís that make you want to scream to the difficult laws that make you want to give up trying the kinds of tests that you are afraid to share with your friends and even those you are afraid to admit to yourself. It shines a bright light on these tests, and in illuminating them, it reduces their power. This book says “you are not alone,” and, even better, “you are not a bad Bahá’í for struggling with these issues.” Struggling with these tests is what ennobles us, and sharing our struggles is what helps us create a real feeling of community. 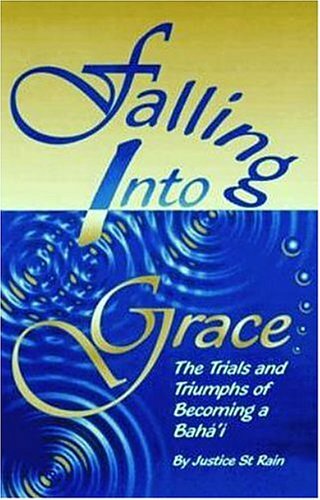 As the title suggests, we must be willing to fall before we can be lifted up through grace. This book has helped over 5,000 Bahá’ís feel “normal” again and reconnect with their communities with more joy and less shame than ever before. It makes a great gift for new Bahá’ís, long-time Bahá’ís, estranged Bahá’ís, and even serious seekers. It is one of my favorite Bahá’í books. I read it four times in a row, (which I never do), because finishing it was like a painful separation from a best friend and I wasn’t ready to let go! It was easy to read, made sense, described my experience, reminded me of how much I am loved and drew me closer to God. Justice writes straight from the heart in an engaging and approachable style, as he documents the daily tests and trials that many of us go through. I HIGHLY recommend it for any Baha’i who is starting to feel the stress and challenges of life. I can’t say enough good things about this book! I hope you’ll enjoy it too! When I first started fasting, I wondered why there wasn’t much written on the subject? I longed for guidance, insight and I was so curious about its effects and what I experienced. I found very few people even desired to talk about the subject. The difficulties and questions I had personally led me to hours of research and experimentation, and to obtain a degree as a Doctor of Naturopathy. I thought I would then share with others not only what I learned but the joy I received in fasting and how I now look forward to it with confidence. How can someone enjoy fasting when the body is so sick? How can you hear the spirit when emotionally you are so messy? I believe that fasting is one of the best remedies for healing. Although it is increasingly used in medical centers, and has been part of treatment in some European and Asian countries for many years, the medical field in the English-speaking world has not used it enough because of lack of understanding and information about fasting. It’s well known that we need breaks during the day to work more efficiently, and vacations to recharge our batteries. Any time we do anything in excess, we eventually need a break from it in order to regain balance. And in Western cultures eating has become excessive and a source of addiction. Fasting has traditionally been a religious practice. It’s a tool of devotion, obedience and love, to gain spiritual power and vision and draw nearer to God. Historically, it’s also been a physical healing tool. Fasting can have various intentions: to regain health, to lose weight, to have clarity of mind. It’s possible for these purposes to work together. Shadi Toloui-Wallace, a singer-songwriter from Australia, now living in Canada, has toured much of North America, Australia and the Pacific, touching hearts through her honest and reflective music. Her ability to creatively express her devotion and love evokes a sense of reverent joy, unique to her work. Shadi draws inspiration from her beliefs, exploration of self, the environment and human interaction. Her work has always placed unity of faith and family at the core. I can attest to the power of this prayer to remove anxiety! Recently I was feeling incredible anxiety and couldn’t find a way out; and spent a couple of nights repeating this prayer over and over until I finally fell asleep. The issue hasn’t yet resolved; but I’m feeling much more peaceful with the situation, and content with the will of God! Dr Mieko Bond is a matchmaker and family lawyer, who hopes to find the perfect match for you based on her extensive network of contacts and genuine passion to help people find love and happiness. She will use her intuition and consider your personalities and criteria for a partner. The service begins with an initial Skype Session after you have filled out an online interview form. She will choose from her portfolio a selection of matches and you can choose which ones you would like to contact. It is a confidential service, you will not be on the website, and your identity won’t be revealed except to those people you are matched with. You can also purchase additional coaching and dating advice sessions over Skype with the Matchmaker. 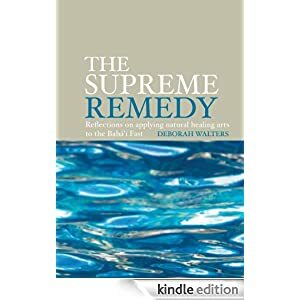 Our “Featured Author” this month, Deborah Walters is also a homeopathic doctor, who specializes in anxiety, depression, chronic pain, sleep challenges, arthritis, chronic conditions and life transitions. She uses a combination of homeopathy, botanical remedies and naturopathy. I Want Patience and I Want it NOW! I have a Bahá’í friend who has suffered with a normally terminal illness for over 20 years, which has left her unable to use her arms. Yet despite such incredible disabilities, she’s still living on her own, in her own apartment and writing books on the Faith by using the trunk of her body to force her fingers onto the keyboard, one keystroke at a time. She requires home care aides to come in and do everything for her, from getting her up and dressing her; cooking and feeding her; taking care of her personal hygiene and putting her to bed at night. In spite of such obvious hardships, she always seems positive and upbeat, saying only that we must really need patience more than anything else in the next world, since we are tested with it so often in this world! That comment stayed with me, and I wanted to see what the Bahá’í Writings had to say about patience. Have a look with me! Who Are We Patient With? We also need the patience of other people! What Are We Patient About? What Robs Us of Patience? When is Patience Needed the Most? When are we NOT to be patient? What Are the Benefits of Being Patient? What are the rewards of patience in the next world? Are some people rewarded more than others for patience? How Do We Get Patience? How do we Show Patience? How Long Do We Have to Be Patient? It might even take as long asa hundred thousand years! If you plant a seed from the Chinese Bamboo tree, be prepared for a long wait. The patient gardener will have to water and fertilize the invisible seed for no less than four years before the first shoots begin to appear. In those four years of silent growth, the “lucky Bamboo, ” as the Chinese call it, is sending out taproots, the root system that spreads out horizontally and downward into the soil. Throughout all those four years, nothing significant is visible at ground-level. A rich variety of moral and spiritual lessons lie hidden in applying the lessons of the Chinese Bamboo to the institute process and cluster growth. As unobtrusive as it may seem to be, things are going on behind the scenes which we have no awareness of, and we have to trust are happening. Seldom do we live long enough to see the benefits of our efforts to be patient, but here’s a story of a woman who did, which moves me to tears every time I read it! A young Bahá ‘i lady pioneered to Bolivia in the 1930 s to open it to the Faith. Having no success in teaching anyone, she began to write to the Guardian expressing feelings of failure. With each passing month she wrote and he replied encouraging her to stay, to remain steadfast, to have faith and to pray. So obediently she continued on. Every day she went to the centre of a small town and in one of the regions found a spot by a fountain and tearfully prayed for the progress of the Faith. After two years the beloved Guardian consented to her wish to return home. The story of this young lady was lost and unknown to the friends in Bolivia. Years later when they experienced entry by troops they organised regional teaching conferences. At the end of one of them they decided to take a group photograph. They found a sunny spot big enough for 1,200 friends to gather. Mr Vojdani took a copy of this photo everywhere to show to the friends on his travels. Years later, friends from many countries had gathered in Paris for a huge anniversary celebration and Mr Vojdani attended as part of a delegation from the Americas. In the crowd a very old lady using two walking sticks hobbled over to them and asked if there was anyone from Bolivia. He said yes. She asked if there were many Bahá ’s there, again he said yes, then she asked if he had any photographs from Bolivia. He showed her the one of the teaching conference group photo. She took it and looked at it for a few moments and then fainted. Later in hospital, when she came round, the shocked friends asked her what had happened. In a frail voice she told her story that she had been sent to Bolivia by the Guardian and every day for two years she had sat down in the exact spot where the photograph had been taken to pray and beseech Bahá‘u’llah to open the doors of His Faith to the people of Bolivia. Seeing the photograph she realised then, years later, that her prayers had been answered. Three days later she died. Now that we’ve dealt with the subconscious mind, let’s move on to the conscious mind, assuming we’ve wakened to the reality of our lower and higher nature and the necessity of keeping every thought captive. It’s helpful to take an inventory of all your fears. They are so dangerous you’ll want to be conscious of what they are, so that you can consciously work to eliminate them. Find a list of fears to consider. This website is a great place to start. As you’re learning, though, it’s not enough to stay at this step, as therapy would have you do. It’s only one piece of the puzzle. We have to choose whether we are people of faith of people of fear. People of fear expect trouble to overtake them. People of faith choose to trust God is working in their life and if trouble should come, they trust God will enable them to overcome the trouble. Fear does not torment them for their faith demands to be fulfilled, faith that God will make a way where there seems to be no way. Every time you recognize Fear rising up you have to respond with what you are going to believe. Make a decision that you are going to walk in love, be loved, and that Fear is not going to be your guide. You have to choose which one you want to believe. If you’re practicing fear, you might want to ask yourself: who are you pleasing and who is your Lord in that part of your life? Decide which kingdom you’re going to worship: fear or faith. That doesn’t mean that every time you feel fear you need to be delivered from it. Instead, you need to apply what you’re learning. You need to throw yourself into the absolute care of God whether we live or whether we die, whether we win or whether we lose. None of that matters. We need to throw ourselves on the absolute care of God. God delivers us from all our fears. Hello! I have the knowledge of God in front of me! Use it! So when fear and worry come, show them your “no vacancy“ sign. I rule my spirit, not fear. I may be tempted by fear and worry but there’s no room at the inn. Fear speaks to me and I do some knee-knocking but I don’t yield to it because I have the law of God strong within me. What’s the worst thing that can happen to us? We can die and go to the next world! Start taking charge of your own spirit. Start recognizing the source of those thoughts. Are they coming from your lower nature or from God? Hold every thought captive. It’s likely more of a parable than a truth, but it makes an important point. If we feed our fears by ruminating on them, keeping on the hamster wheel, they will grow and dominate our lives. If we feed our higher nature through immersing ourselves in the word of God, we will align ourselves with our true purpose and the fears will fall away. The choice is ours to make. Shoghi Effendi makes a similar point, when he reminds us of our high purpose and urges us not to allow any anxiety to deflect us from achieving it. Despite his worry, he didn’t let it stop him from taking action as he pondered the problems and ensured that the right solution was found. That’s what we must learn to do too. How much more so, when the lying is coming from us! We want to stop lying to ourselves for another reason too. It’s because lying is the worst quality, most odious sin, most blameworthy quality. It destroys all human perfections and leads to other vices and is the foundation of all evil! Surely that’s reason enough to focus on what’s real! When you transform your negative outlook into a positive one, you can accomplish so much more. In doing so, your mind will be released from negative programming, allowing you to excel and succeed throughout your life. Fear, you are a product of my lower nature. Fear, you are just an idle fancy and vain imagining. Fear, God didn’t give you to me. He gave me the power of love and the ability to discern good from evil. Because you’re not from God you must be evil. Fear, my father is in Heaven, on His throne and you’re not. Fear, Baha’u’llah’s teachings told me all about you. He is my Deliverer, my Redeemer, my Savior. I’m under His protection at all times and under all conditions. He is my Comforter and the One who leads me into all truth. He is the Power of God within me. I’ve joined myself to God so if you want to tangle with me, you’ll need to tangle with my Father. I’m under the shadow of His wings and I am perfectly safe. I will not listen to your lies anymore. So, what are you going to do about that? What about the Fear of God? What Can Others Do, To Help Those Who Are Afraid? And then we ask God for His forgiveness for blaming Him and others, and for holding on to the fear. We do this for every single incident we can think of. It’s a simple process but unbelievably powerful, effective and life-changing. I encourage you to try it once and you’ll be hooked! For the first 17 years of my life, I was subjected to some of the worst forms of abuse possible, at the hands of my parents. By the standards current today, particularly in the abuse recovery movement, what was done to me was unforgiveable, and yet I forgave! I came to realize that the abuse perpetrated on me by myself, was far worse than anything my parents had done to me, and I did it every minute of every day for the next 36 years. How? By believing I was unworthy; a worthless piece of s**t; unwanted; unloved; and unlovable. I believed these lies I told myself about what it meant that my parents could treat me in such an abhorrent manner; as though I was a “thing”. I told myself that if they treated me that way, they must not love me, therefore, I must not be loveable. These lies kept me from being able to seek out friendships and a second marriage; kept me from fulfilling my potential in the work-world, because they filled me with self-doubt, self-loathing, self-hatred and self-pity. With that in mind, everything I consider and reflect on is now done totally through the eyes of the Bahá’í Writings. I certainly don’t have all the answers and I welcome other people to share their understanding of the Writings related to any given issue in a humble posture of learning, so that we can all advance the process of better understanding how to recover from abusive situations. This was totally liberating! I loved their string of adjectives “strive to develop”, which suggested that it could take a lifetime, and even if I never got there, as long as I was striving to develop, that was OK with God. Secondly, I had to develop forgiveness “in my heart”, not between us! So if I was never able to spend time with them again, it was enough to develop it in my heart, between God and I. Finally, they wanted me to separate my parents from their sin – a concept I’ve just learned recently, but when I come back to this quote now, I can see what this means “to attain a level of insight which sees them as captives of their lower nature”. By refusing to forgive them, I was not honoring the perfect beings that God created, I was only seeing the monsters of their lower natures. That truly was liberating! the level of vulnerability you perceive within yourself to being influenced adversely by them. I took each individual act of abuse that had ever happened, for each person who had abused me. I looked at the lies I’d believed as an outcome of each single event. I forgave myself for each one; asked God for His forgiveness; and forgave each perpetrator. Immediately a huge weight was lifted off my shoulders and I’ve been free of anxiety (which is really fear) and depression (which is really self-pity) ever since. Once I understood that God loved me and created me perfect, I realized I had to forgive the lies emanating from my lower nature about my being unworthy and unlovable. They weren’t God’s truth, therefore why would I make them mine? It’s entirely possible that the person who committed the sin is unwilling to ask for forgiveness. In any case, they are required to confess it and ask for God’s forgiveness, not man’s. They may even have passed on to the next world, and you are unable to talk to them about the impact their sin has had on you. It’s still important to forgive. When the offense is ongoing, for example where there is ongoing abuse or violence of any kind, you will need to get to a place of safety before starting the process of forgiveness. There is a difference between justice and forgiveness. We all have to meet our Maker and justice is in the hands of God. There’s a big temptation to focus on the injustices, to want to bring “the other guy” to justice, but this is not our job. When I was in the deepest despair, remembering traumatic events of my childhood, I came across this quote, which helped to lift me out of my “self”. I was feeling a lot of “poor me” and “why did this have to happen to me”, and then I had to stop and remember Bahá’u’lláh’s days. Bahá’u’lláh was born into a wealthy family and was expected to follow his father into an important position in the government of Persia (Iran). He didn’t want the position or the power. Instead He wanted to dedicate Himself to helping the oppressed, sick and poor and to champion the cause of justice. As a result, his life included a series of imprisonments, and banishments. At one point He was imprisoned for four months in an underground reservoir for a public bath, with its only outlet a single passage down three steep flights of stone steps. He sat with his feet in stocks and a 100-pound iron chain around his neck. He and His fellow prisoners (150 thieves, murders and highwaymen) huddled in their own bodily wastes, languishing in the pit’s inky gloom, subterranean cold and vermin and stench-ridden atmosphere. When he was freed from prison, He and His family were banished to Bagdad (Iraq), a 3 month journey on foot over the mountains in the middle of winter without enough food. He stayed in Bagdad for 7 years, and then was banished again to Constantinople (Turkey), where he stayed for four months, and then was exiled again to Adrianople (Turkey). Again it was in winter and they didn’t have the proper clothes to protect them from the harsh weather. In order to drink, they had to light a fire to thaw ice from springs along the way. He stayed there for four and a half years and then was banished to the prison city of ‘Akká (Israel), to which the worst criminals were sent. He remained there for the rest of His life (24 years). He was discredited by His uncle, poisoned by his jealous half-brother and witnessed the death of His son. He was betrayed by people He trusted, stoned, and isolated from the Believers. For a time, to protect the Faith from the efforts of His half-brother, He lived as a hermit. He was the victim of ignorance, injustice, cruelty and fanaticism. But every crisis was followed by victory, and this, I believe, is what is important to remember. Although my repressed memories included all the positive and neutral memories too, once they came back I was able to see that like Bahá’u’lláh, there were times in my life that were peaceful, and activities that weren’t abusive. From anger I learned to find my voice and take action. From poverty I was protected from materialism and learned to rely on God. From estrangement I gained knowledge of myself, and through it, knowledge of God. From being silenced, I was protected from backbiting and gossip. So when you’re feeling in the pit of despair, I urge you to remember not only the negative things that happened to you, and to Bahá’u’lláh, but to remember the victories that came from them as well. Recently I’ve been reading the newly released “Tablets of ‘Abdu’l-Bahá'” which is filled with His answers to questions people put to Him. It’s so full of love, I feel that reading them is like reading love letters to me too! Sometimes it’s not enough to turn to books for comfort – you need a real person to talk to. That’s when you can use the Institutions of the Faith.